Creating and managing agile testing process is always frightening as you never know what to start with and what you have to deal with. That’s why one always wants to begin with something comprehensible and easy to work with. Our EasyQA test management tool gives an opportunity to create and manage own organizations and projects to build a software testing life cycle and, funnily, to adopt an agile testing process. You just need to click on Add Organization in Top Bar Menu or Create new Organization as you can see in the picture below. Now you need to indicate Title to create an organization and voila you already have your own organization. You can add information, edit it as well as add members etc. The user has an opportunity to use all QA tools for the project testing within EasyQA test management tool, plan all team activities and get latest info about the product. You create a plenty of organizations becoming their owner. At the same time, another user or administrator is able to invite you to their organizations, where you will be either an administrator or a user. To make information more detailed you only need to add an organization’s description and upload a picture/logo. It is not necessary but will help you and your members to find in the My Organizations list of our test management tool. If you are your company’s owner or the other company’s admin, you are able to invite and manage members. Software testers, Quality Assurance Engineers, Developers, Designers, Projects Managers and many other IT professionals can be participants of your organization to create innovation products with a high quality after an active execution of different types of software testing, such as functional, UI/UX, performance, security etc. The invitation form allows inserting a few email addresses at the same time, separating them by the comma. If the user you are inviting is already registered in EasyQA you will see him/her in the list. The user will receive an e-mail with the notification to join the organization or with the proposal to register in our web-based test management tool. 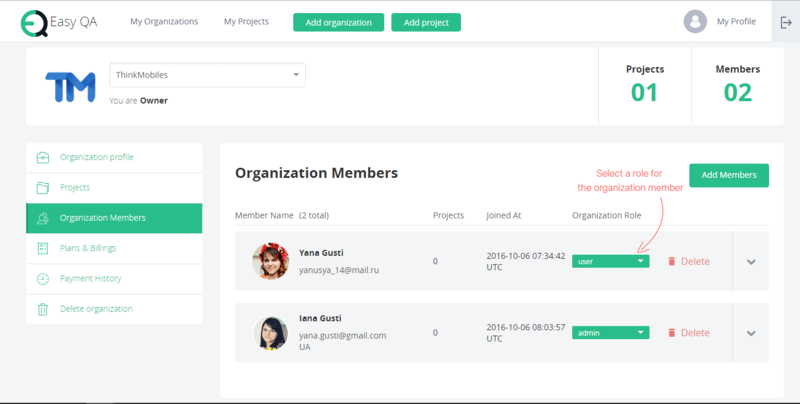 You will be able to review the user (-s) by opening and clicking on Organization Members. If the person you are inviting is not registered, he/she will receive an e-mail with an offer to register in EasyQA system. After the registration being processed, the invited user will appear on your organization member list. Admin role gives a member the opportunity to perform all actions as an owner except for deleting the current organization. All those testing procedures you can accomplish using EasyQA test management tool. You are able to change your organization title, description and logo at any time by pressing Change button. The owner has an opportunity to delete the organization if he/she need. Summing up we can make a conclusion that Easy QA sufficiently simplifies your task as an organization creator or manager giving you a possibility to easily build and test your own projects and control all the necessary testing processes using only one product – EasyQA test management tool. So please, contact us without any hesitation and use EasyQA having a chance to estimate all the system’s advantages and opportunities.